During the Cold War, America had a defined policy — and everybody knew what it was. Following the collapse of the Soviet Union, the world was still safe enough for Washington to get away with not having a clear strategy. However, in today’s increasingly dangerous and unstable geopolitical environment, that’s no longer an option. “America has not had a [post-Soviet] foreign policy strategy,” Bremmer told Business Insider in a sit-down interview. “We’ve chosen to be risk averse and reactive. You look at the Gulf Summit with the leaders not coming. You look at Netanyahu. You look at the Russians. The Chinese have the AIIB. All of this. Indispensable America — US exceptionalism on a global scale. Indispensable America is the idea that Americans care about and actively work to make the world safer — especially because this ensures the safety of the American people. Furthermore, if America won’t play the role of the world’s policeman, then no one will — and that could lead to a much more dangerous world. Moneyball America — running America like a company. Moneyball America takes a calculated look at what America is spending money on, how to minimize costs, and how to maximize the benefits. Independent America — American values do matter, but the way to promote them is by investing in and focusing on the US rather than policing the world around. Once you build up and improve America, you will inevitably project American values across the world. Basically, “‘Indispensable’ is going with your heart, ‘Moneyball’ is going with your wallet, and ‘Independent’ is going with your head,” according to Bremmer. Business Insider and Ian Bremmer discussed America’s current role in the world, how the geopolitical environment has changed since the fall of the Soviet Union, and how that affects the choices America has in the future. This interview has been lightly edited and rearranged for clarity. Business Insider: You write that America has three choices. However, as you trace through Bill Clinton’s, George W. Bush’s, and then Obama’s foreign policies, it seemed as though many of their policies were a product of the world that they were leading in. To what degree would you say that it’s external factors that actually shape US foreign policy? To what degree do we have a choice? Ian Bremmer: Well, it’s funny because all of my previous books were about big global structural concepts. I’m not someone who likes to talk about just blaming Obama. Because you also ask, what about Congress? What about the American public? China? Russia? Europe? There are lots of reasons why we’re in the thicket geopolitically that we are. But, the fact of the matter is, the US president has a lot of flexibility on foreign policy. As much as Congress may say that they want to play more of a role, they really can’t. I mean if we do or don’t do an Iran deal, that’ll be largely on the basis of Obama. The reaction that we’ve had on Russia/Ukraine has been influenced very significantly by Obama. I happen to believe that we are entering into this period of geopolitical creative destruction. The last time we’ve seen something like that was after WWII. I believe that this is a G-Zero environment. I believe that despite the fact that the United States is the world’s only superpower. I do not believe that this will be an American century, nor do I believe it will be a Chinese century. I think we’re done with centuries. There’s just too much volatility. But I absolutely believe that in an environment where there’s much more volatility, where there’s much more geopolitical conflict — that’s one where the decisions made by the American president happen to be one of the most significant factors that you can control. And the most significant one that we can control. It’s been obvious that for the last 25 years we’ve abdicated. We’ve not had a foreign policy strategy. We’ve chosen to be risk averse and reactive. And when the Soviet Union first collapsed, that was fine, because we’re the only game out there. But we’re sitting here in 2015 and the American economy is rebounding, and unemployment’s down, and Obama’s approval ratings on foreign policy are in the toilet, and the international reaction to this has been bad. You look at the Gulf Summit with the leaders not coming. You look at Netanyahu. You look at the Russians. The Chinese have the AIIB. All of this stuff. And the point is: how is America going to react to all of this. I did not write this book as a pure exercise. I actually believe that the Americans have choices. And those choices will not necessarily shape the entire world in our image, but those choices will absolutely affect the trajectory of the United States in a global environment that is much more geopolitically uncertain. And I think that it behooves our president to do that. It’s not that I fear that we’re not going to do anything — it’s not that I fear another eight years of incoherent “Question Mark America.” What I fear is another two, or four, or six years of “incoherent America” and then there’s a crisis. Then there’s a — God forbid — another 9/11, or there’s a massive cyber attack, or Europe implodes, or China does something really assertive — whatever it is. What worries me then is Americans, absent a strategy, are going to overreact — just like we did with Ebola, just like we did with 9/11, just like we do with everything — we overreact. And we would be overreacting without a strategy, in an environment not like 9/11 (where America is on top of the world), but where actually the world is blowing up. BI: If we look at the major world leaders Obama, China’s Xi Jinping, and Russia’s Vladimir Putin — they all have very different strategies in their foreign policies. Obama, as you write in your book, defines a lot of his policies in negative terms (“we’re not going to put troops on the ground, for example). Xi tends to keep a blank face. And then you have Putin, who’s always in the public eye and very aggressive. How do you think these strategies have played out and how do you think they will continue to play out? Bremmer: So I think that the only country in the world with a global strategy right now is China — and I think that that should unnerve us. I think that China has decided that militarily they cannot compete with the United States over the medium term, maybe even in the long term. Outside of Asia they can’t. I think [former Australian Prime Minister] Kevin Rudd understands this very clearly and I agree with him. But the Chinese do want to compete with us economically globally. They want to compete with our standards, they want to compete with our influence, they want to compete with our architecture that we’ve created, and they’re doing that through the BRICS Bank, and the AIIB, and through the Silk Road Initiatives — you name it. Over a trillion dollars being spent. No one else comes close. And it’s a real strategy. It will certainly be overreach in some places, but overall, I suspect it will work. 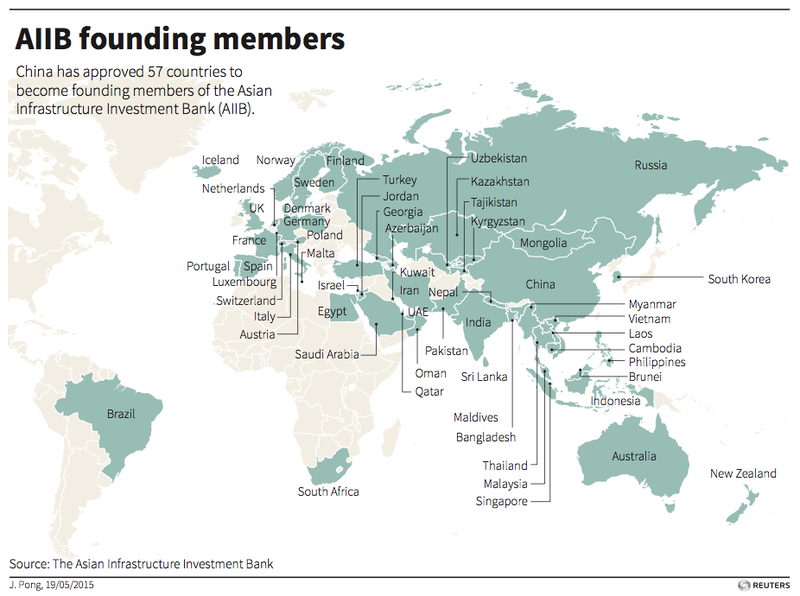 ReutersMap highlighting members of the Asian Infrastructure Investment Bank. Russia is in decline. Their president is extremely upset about that. He has hit upon a policy of aggressiveness that works very well domestically, and he wants to project power. And he wants to particularly do it militarily in a way that the Chinese would never do. Or certainly, would find very counter productive today. So the Russians are the ones who want make sure that we know that their navy can be right in Latin America, and that’s just fine by them. Their fighter pilots, their bombers will have their nukes right on there. And they don’t care if they find sort of with just line of sight. No radar at all, that sort of stuff. And obviously the Russians are much more willing to take risks and to make mistakes as a consequence of that. Putin personally is playing a very different game. Do you think it’s that the Russians are willing to take risks, or rather that they aren’t great at strategizing? Bremmer: No, I think they’re willing to. Putin is thinking much more tactically than he is thinking strategically. But I think that to the extent that he’s think strategically, he’s more willing to accept risks because he sees that a more risk averse posture over the last twenty years has led to incremental gains from the United States and allies that don’t really respect the Russians very much — in a way that they respect China quite a bit. So you look at anything from sending an ambassador over to Russia who meets with the opposition on the first day — we’d never do that, the American ambassador to China wouldn’t do that because we think that China’s too important. NATO enlargement, missile defense, Baku-Tbilisi-Ceyhan pipeline, energy exploitation from the Caspian to the West, and now Ukraine. A lot of this is just — it’s not that we want Russia to decline, it’s just that we don’t care. It’s not really important. Putin is tactical and risk accepting. Obama is tactical and risk averse, which you see in Syria. He makes the misstep on the red line, and then he does everything possible, ties himself in knot contortions, that clearly hurt him strategically, to avoid getting sucked into Syria. And he’s done this in Iraq, and he’s done this with the Iran deal, and he’s done this in lots of different ways — even in Russia. Some of those policies have been okay, like Iran — so far. But some have been disastrous — like Syria, and like Russia. Risk aversion in a world that’s becoming much more dangerous, and you’re the largest power out there, is not a recipe for success. Because again the problem is that not just that Americans think that Obama’s doing the worst on foreign policy of all other issues. It’s also, when I talk to foreign ministers from every country around the world, every one of our allies — they’ll all tell you privately: “My God. What does America stand for? Like, what do you guys want?” And they all want to hedge as a consequence of that. BI: So you present three choices for Americans and the next American president. How can each one go horribly wrong? Bremmer: Indispensable can go horribly wrong if we get radically over extended. If we end up just spending ourselves into oblivion on things that really don’t work, causing more problems than we solved at the same time, and undermining everything that America stands for internationally. We’ve already seen a bit of this at the wars in Iraq and Afghanistan, so imagine that times five because we won’t have the same level of support from allies that we had in those. And the challenges that we’re getting are much bigger. And our standing the world is more problematic, which means it’s unlike after 9/11 when we were in great shape. If we have a problem like that again, you know, we’re going to come out of it much worse. That’s how Indispensable goes wrong. It’s really easy to see that. Moneyball can go horribly wrong because you’re talking about running the country like a company. Now, how does it go wrong when you run a company? You make bad bets and they go bankrupt, right? And the thing about Moneyball is you’re basically saying we’re going to make big bets in a few small places while the world is very volatile. And what happens if the big bets you make end up being the wrong bets? So what happens if you do the “Pivot to Asia,” and you’re all in Asia, and, actually, those bets are misplaced. And then the Europeans say, screw this, and they leave you, and they become much stronger — or they fall apart. In short, what happens if you just make the wrong bets with Moneyball in a world that moves so quickly? What happens if you’re spending all of your money on cyber and and it turns out that actually cyber goes away because quantum computing — within five years tops — means that you don’t have any privacy on anything and no one can hack because everyone gets everything. And suddenly, we just wasted like an enormous amount, and we’re completely not focused on other things that are becoming much bigger. You can run a portfolio of companies really well with the Moneyball strategy because if one goes bankrupt, you’re fine — because on average you’re doing really well. Well, you don’t have a whole bunch of countries that you can try this with. We’re not trying this out on the whole Caribbean — it’s America! It’s the worlds largest economy, the world’s largest superpower, and you’re going to suddenly take bets? I don’t think it’s a good idea. There is real downside with each of these three. Now, of course what’s interesting is that the downside differs for the United States. BI: What is the most dangerous about the narrative of American exceptionalism that comes with these strategies, and specifically, comes with “Indispensable” America? The most dangerous thing is that we believe it. And therefore, we actually believe that our values are truly better than other countries, and so we refuse to actually look at the world through their lenses. That’s the most dangerous thing. The fact is, our view on human rights is clearly on balance better than the Chinese — it’s not even close. But that’s not necessarily true all the time of our view on corruption or special interests or free markets, capture of the regulatory process. It’s one thing when we’re the biggest economy out there, and no one can hurt us, or they don’t like our way, even if we may be wrong, you have to live with it, right? But its another thing if these countries have the ability to say no and damage you. So with a country like China, it really behooves us to try to understand the fact that the Chinese don’t want a free market economy, they don’t want a liberal democracy. And we need to understand why that is. And the more that we’re exceptionalists, the more that we believe that the Chinese really do want to be like Americans, that they just want to be liberal Democrats like us, that they just need to get there, and we just need to help them do that — when I really don’t think that’s true. And even if Russians did want to get there, Putin is running Russia. And Putin’s ability to hurt us by promoting that is actually significant — and that’s the most powerful human being on the planet. So, the bottom line is, I think the biggest problem with exceptionalism is that we believe it. IB: Completely at odds with each other — with surveillance, for example. BI: Yes. How do you think that these two sides should fall into the three choices America has? How should they be addressed? And is one more important than the other? Indispensable, as much as it likes to talk about protecting American values globally, it tends to align itself with the people in the US above all. And not necessarily with issues of privacy. Whereas Independent kind of leans kind of opposite direction. And Moneyball doesn’t really want to talk about values at all. So the question is: do you really want to promote American values globally? What does that mean? Do you want to focus on American values at home? Do you want to demand respect, or do you want to command respect? Indispensable is about demanding respect, and Independent is about commanding respect, and Moneyball is about, look, we’re not in the respect game, that’s not what we’re doing, we’re really just trying to win. I did not know which of these I supported when I wrote this book. I did not know which of these I supported even when I finished this book. This is hard. I think that all three of these are workable. And I’m someone who grew up — I’m not a millennial — I grew up with the Cold War. And I went to the Soviet Union when it was really the Soviet Union — the first time in 1986 — and I saw what it meant to be up against a regime with nuclear missiles pointed at you, that really saw you as your antagonist all over the world. And how much it meant for America to be standing up with our friends in Eastern Europe, and Radio Free Europe, and Voice of America, and Captive Nations Parade. All those things that ultimately won the day for the Americans because they believed in something. That we were prepared to support, and support aggressively, over the world. But I also see how much the world has changed in the last 30 years since I’ve been aware of international affairs. I’ve seen this country go through an extraordinary transition from days of fighting the Soviets in the Cold War to the new world order that we were in charge of to 9/11, and we’re going to fight the global war of terror and the “Axis of Evil,” now to complete incoherence, and not knowing what we stand for anymore. And it really pains me to watch that process. And I felt like I had to write a book that was going to stand up and give the Americans more than just “this is the only way forward.” I had to be brutally honest and give the best possible argument, and I know that there are people out there in America that support these three. And if you read the quiz at the beginning of the book — I mean, these are hard questions. It’s not easy to say which of those Americas do you really support or want the most. These are conversations that I think are happening around dinner tables in the country today, the problem is, they’re happening around dinner tables, but then when you turn on the television, they stop it — because you’re not having that discussion anymore. Because the people on television, and the people on the radio, and the people writing newspapers, and the blog-spots, and people you’re following on Facebook — those public voices are not talking to each other, they’re talking past each other. They’re telling you that there’s only one way, and everyone else is an idiot. And we hate that. We believe in more than that. We want authenticity, and authenticity means that there isn’t only one way. And so I don’t know how well this [book] is going to do. But if it does anything, what I really want it to do is inform. I put it out now when we don’t even have all the candidates yet, when I don’t even know which one I would vote for, when most of them don’t have a coherent foreign policy — because I want it to help structure and inform the debate. It killed me in 2012 when Romney versus Obama spent 90 minutes on foreign policy that we will never get back. Those 90 minutes are gone. And it was useless. And the only thing they debated seriously was Benghazi, which was largely a partisan and made-up issue. And all of the big issues that really face the Americans where just no where, and it feels quaint that you can have a foreign policy debate that feels so incredibly irrelevant four years ago. And I don’t want that to happen again. This time around I want people to force these candidates to actually not just say “we stand for America,” but say what you’re going to do to stand for America, what you’re going to spend to stand for America, where are you going to cut it loose. We have to hear from the people we’re gonna vote for — that’ll be our president probably for the next 8 years. We gotta hear it.